Kashim Shettima, Borno State governor, yesterday endorsed Senator Ahmed Lawan and Femi Gbajabiamila for President of the Senate and Speaker for House of Representatives respectively. 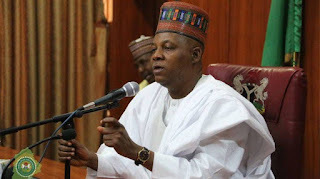 Addressing newsmen shortly after Lawan’s campaign organisation visited him in his Abuja residence, the Senator-elect from Borno State said that he has nothing against his kinsman, Senator Ali Ndume, who also hails from Borno State, contesting the position of the President of the Senate. Recall that Ndume had said that Borno elders had called on him to contest for the position. But the governor said that he’s not aware of such endorsement as he has consulted with leaders of the state before backing Lawan. He said he cannot work against the directive of the party, which endorsed Lawan for the position. He said: “I have very little to say, ordinarily I am not even supposed to come here because there are three things to be combated. I hail from the same state with the distinguished Senator Ali Ndume. And I appreciate the fact that politics is local. But politics is also national.